“Build it and they will come…” not quite accurate online! To get people to see your site, you will typically need to promote it. In this chapter we will go over a few very basic search engine optimization (SEO) strategies if you are looking to learn more check out our detailed SEO Guide. In a nutshell, they want to show the most relevant information that answers the question the searcher has. They use an incredibly complex algorithm to do this. The two biggest factors are content on a website and “votes” (typically called links) on other websites. That is an overly simplistic explanation but should help give a basic idea of SEO. Every time you do a search in Google or any search engine they are showing you the ten best answers that they could find. If they continue to give you good answers, most likely you will come back, and you might click on an ad. If they give you bad answers you might do another search, or you might go to a different search engine. This is why it’s vital that they give you the best answers. Google alone spends more than ten figures a year to make sure they are giving you the best answers, which is why most individuals should not attempt search engine optimization. Everything we teach you in this section is currently safe and should be best practice for years to come. If you go to other websites they may share things that could cause you problems, so just stick with what we share and you should get the results you are after. One of the things that search engines love is great content. Why? They want to show their visitors the answer to their question. If you are producing great content on a regular basis, then the search engines can feel comfortable sending their visitors to your site. The first step to improving your ranking is to begin adding content to your website and social media properties. Everyone will be a little different in terms of what they add, but ideally it will be about you or your skill set. We recommend writing 500+ words of content when making a post on your website, this may seem like a lot at first glance, but it’s about a page worth of content. Ideally you want to have at least five pages on your website before you really see results in the search engines. As you add pages make sure to share the URL in your social media sites, this will give a boost to everything at once! In the offline world, the way to gain a good reputation is by getting to know others and adding value to their life. The same goes in the online world. Since you don’t meet people face to face, you need to contribute to blog comments and forums. Both of those places got a bad rep in the SEO community a few years back because spammers were using tools to gain thousands of links by blasting these sites with spam. However, they can give you a boost in the rankings if you use them the way they were meant to be used, by contributing. For commenting the first thing you will need to do is find about ten websites around whatever field you are in or looking to go in to. It is important to choose sites that are active with great content. Next you will need to read an article and write out a comment that is relevant to that article. If you’ve never commented on a blog before it’s very easy. Scroll down to the comment area and look for a place to add your comment. 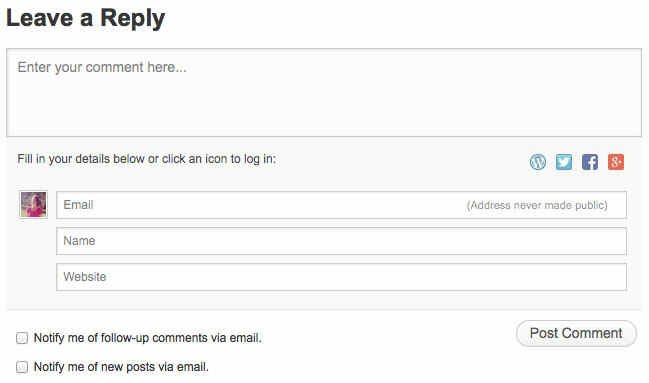 Individual sites have different forms of commenting, so you may have to create an account to post a comment. However, you can use that same account on other sites (just make sure you add your website when you create your profile). If they are using the standard comment field in WordPress, it will look like this. Use your real name. In the website field put a link to one of the properties built in the last chapter, ideally you will want at least ten comments using your site, and 5-10 for each other property. Forums are like the water cooler of the web. You can find forums on nearly any topic, and some are more active than others. Just like with commenting the goal is to contribute not just post junk for the sake of getting a link. Otherwise you will typically get banned quickly. To get started head over to Google and type in your niche and add the word “forum” on the end. You will be presented with a list of forums that you can sign up on, if not you may want to do a broader search and then narrow down which forums are right for you. Similar to commenting each forum is a little different, however, most will allow you to create a profile with an image, bio and link to your website (maybe more than one). Fill these out completely, and then we recommend making 5-20 posts on each forum. If you don’t know what to write look at what others are writing and you’ll quickly get an idea of the style that forum has. Also take a look at the dates, so you are not commenting on something that is five years old. The last piece to this puzzle is time. Search engines typically don’t respond instantly to the work you are doing. In fact, it could take a few months before you see the full results. You can speed up the process by repeating the steps above to some extent, but it will still take a certain amount of time before those results kick in. Unless you have an extremely popular name, it shouldn’t take a ton of work to see visible results for your name in the search engines. Just take this step slowly and it will all come together as you work through it! In the next chapter, we will discuss a vital piece to your online presence, monitoring. By staying on top of issues, you can take steps to mitigate any issues quickly before they blow up. See you in the next chapter!